The demand for more individualized products requires a corresponding flexibility of process, meaning it is becoming more common to reconfigure production facilities. Associated changes in production control operations are required. These changes must be implemented efficiently if companies are to be able to survive. Measurement and quality control is an essential part of this change, a pillar of smart, flexible manufacturing. As digital twins give more people involved in manufacturing a better holistic vision of the entire product lifecycle, more people can appreciate the role of measurement in manufacturing. And it is being introduced earlier. Today companies are driving measurement into the product development process earlier to ensure that, through robust product characterization, all the product function sensitivities to manufacturing variation are removed in the design stage. “Everyone in the business process, from design to the final process and shipping, needs to be involved in quality control and inspection,” remarks one engineer in this report. “Gone are the days when someone sits behind a desk on his own, printing a QC report.” Digital manufacturing tools are making 3D measurement a more visible and respected area for engineering careers. Now more than ever, manufacturing industry needs trained, knowledgeable measurement personnel. The ideal manufacturing measurement practitioner today is likely to be a manufacturing engineer who has gained accredited metrology training. 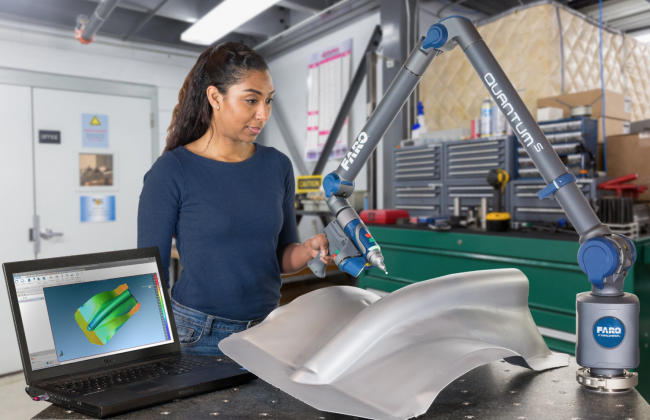 The person will be trained to use – and to fully understand – end of line CMM measurement as well as new techniques to measure parts in-process. He/she will be trained to a competent level in several relevant and new metrology techniques, covering non-contact scanning metrology including laser, optical scanning and x-ray tomography, and understand the issues and limitations of capturing dimensional measurement during processes like machining / milling / turning / grinding, additive manufacturing and metal cutting (laser or plasma) processes. Knowledge of how other materials are measured is also key, with the rise of polymer printing and composite materials. For next generation skills, “Industry 4.0” brings a new set of challenges around informatics and Big Data. The volume of data that is generated by embedded metrology will be orders of magnitude larger than what metrologists have handled in the past. Engineers with informatics training will need to mine this vast quantity of data for the useful elements and turn these into meaningful information that can be used in production. It is expected that as companies change their processes to build-in metrology earlier and throughout the manufacturing cycle, the measurement profession will organically gain a higher profile. Education institutions worldwide are responding. The Center for Precision Metrology at The William States Lee College of Engineering at UNC Charlotte is the US’s primary measurement institution. Metrology is a focus on its mechanical engineering graduate programs and it is embedding measurement into more engineering courses. 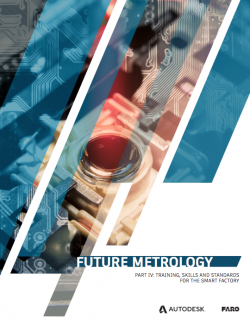 The National Physical Laboratory in Britain has developed a “Trailblazer apprenticeship standard” for Metrology Technicians, approved by the Department for Education, developed at both Level 3 and new Level 5 apprenticeship standards. This white paper by FARO and Autodesk, the last in a four-paper series on Inspection for the Smart Factory, explores what industry needs to do to upskill measurement professionals for the fourth industrial revolution.